Billy Bedlam provides truly unique comedy entertainment. A highly visual combination of multi-instrumentalism and "off the wall" illusions which defy comparison. Billy plays a vast array of musical instruments! Some are instantly recognizable, others are especially diverse and original additions. Like the WORLD'S TALLEST TUBA, the DESK BELLA PHONE or the HOSEPIPE AND FUNNEL, everything including the KITCHEN SINK!! 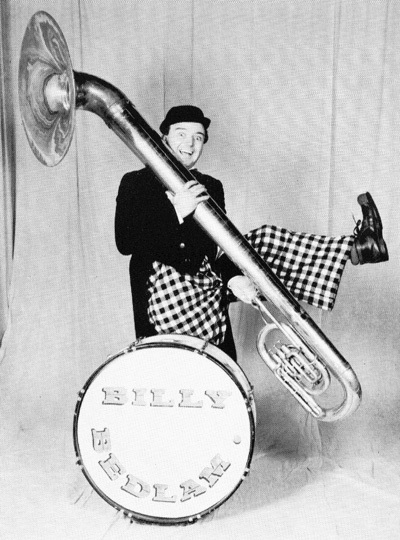 As a world renown performer, Billy Bedlam holds a unique place in the history of manic musicianship: BILLY BEDLAM IS THE WORLD'S FASTEST TROMBONE PLAYER.. A record that was broken, on a single circus trapeze whilst swinging high above the studio audience on the B.B.C. TV. program "THAT'S LIFE". As a performer in the musical world of magic and illusion, Billy has shown himself to be very creative and original in approach. Presenting baffling tricks and comedy illusions that have little comparison in the world of entertainment. Billy Bedlam - A Truly Special, Speciality Act!